As I happened to be working on the Sewing Themed Table Runner today, I scrounged up the nine squares for the first block in the Whimsical Fabric Quilt Along - January. 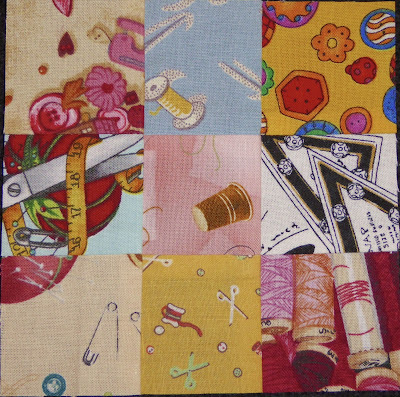 This little pretty makes up to a 5" square block (9 patch using 2" squares) .... I am very happy to see the last few bits and pieces of these fabrics GONE! Today I set up my Featherweight to do the free motion quilting on the table runner but sadly it isn't working well. The light cream cotton reel print fabric was not the easiest to work with for piecing (the little cotton reels have like a plastic touch!) but quilting through them is proving a nightmare! I am going to switch over to my Brother PQ1500 as it has more power and quilts beautifully and should be able to deal with that plastic fabric!! Thanks for joining in the Whimsical Fabric Quilt-Along. Love your square with all the sewing prints. Oh no....there is little worse than a machine not working well when you are ready to go! Our 1500 is the best for quilting!!! Your theme is fantastic!! I can't wait to see how it all comes together! Love your runnner and your block is so cute! 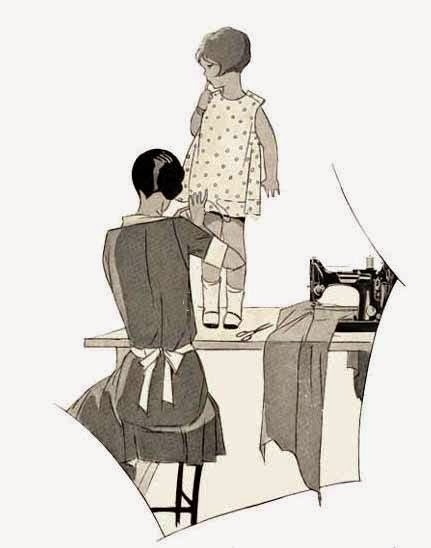 The sewing fabrics are simply darling! And the table runner is gorgeous!